23rd About the Ravine – Results…? On a beautiful Wednesday morning, we head once more up the hill to the town hall, this time to meet the mayor. The receptionist telephones through to upstairs – “Gli Inglesi, sopra la spazzatura…” we are famous already, or shall I say infamous. She sends us up to meet Rosalia on the second floor. The offices are grander here, and we are received with extreme politeness, even a touch of reverence, offered a seat and asked about our concern. Rosalia of the second floor is as touched by our story as was Rosalia of the first floor (it seems one has to be called Rosalia to get a secretarial job in Zafferana Council), and she views with disgust our latest photos, which include some rather unsavoury shots of freshly butchered horses’ heads. What opens the doors to people’s hearts is the fact that we are strangers who spend their free time, even their honeymoon, cleaning up nature. After 10 minutes wait, we are lead into an office where –surprise, surprise – we meet Sergio, the consigliere. Sergio has good news for us. Last week, the sindaco sent a formal request to the police, who then sent a formal request to the regional courts, to be allowed to fix CCTV cameras by the bridge. Everything has to go its bureaucratic way; a camera infringes on privacy rights. They are expecting to get the go-ahead within ten days, by which time they will also organise vehicles with the necessary equipment to lift all the rubbish out of the ravine, including the tyres, fridges and vehicles. Sergio emphasises that Zafferana prides itself on being a clean town, and that they will deal with this incident despite the fact that the bridge does not lie within their boundaries but is the county of Catania’s responsibility. He promises to let us know when the cleaning action will take place and he alerts us that this Sunday the group PuliAmo Zafferana will meet for a cleaning day, if we would care to join them. He also tells us that our request to visit the Isola Ecologica means obtaining an authorisation from the desk of waste control, but we should be able to get this in due time. Once Sergio has explained everything, he takes us across the hallway to the mayor’s office. Alfredo the mayor jumps up from his seat behind a huge desk and comes towards us to receive us with a cordial handshake. He thanks us for our initiative and tells us that Zafferana, although just a small town, includes a huge area in its jurisdiction (bigger than Catania) and that the question of waste disposal is an ongoing and very complex concern. He shows us the Council’s initiative to print educational title pages to children’s exercise books, which get distributed in all schools, each year with a different message. Last year it was about separating different types of recyclables, this year it tells about the initiative of linking clean water and waste disposal. For every kilo of recyclable waste that a resident of Zafferana brings to the Isola Ecologica, they receive a credit note for a litre of purified drinking water from the Casa del Acqua. As we leave, the mayor gives us his promise that within 10 (working) days, the ravine by the bridge should be clean and the CCTV in position to catch further perpetrators. Of course one shouldn’t count one’s chickens before they are hatched and we are looking forward to promises being put into action, but what we can say for sure is that everyone we met in the council received us with the utmost politeness and a willingness to help. 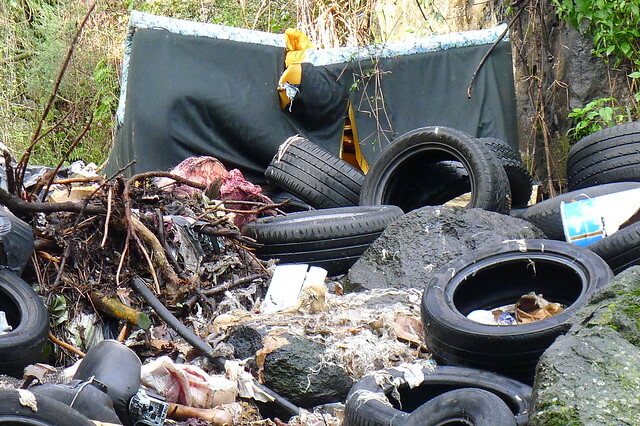 Everyone there wants to make a change regarding the current situation of illegal dumping, but it needs a lot of money and co-ordination, and it can at times be beyond the town council’s financial abilities to do so. We look forward to joining PuliAmo Zafferana on Sunday. Apparently more than 300 people took part last month. Posted in Spazzatura Siciliana, Uncategorizedwith no comments yet. Frank and I borrow Rosi’s car and with the two Antoninis in tow, we set off to the other side of the ravine, where we have the neighbour’s keys to get through the property to where we have compiled the rubbish. Antonino is keen to walk up the ravine to view the source of the problem. As we approach, we are hit by the smell of rotting cadavers, and sure enough, new evidence has been thrown on top. Antonino gets on the phone to his boss to bring home the urgency of the matter. As we stroll back down the ravine, Antonino tells us that he’s just a simple dustman, but with a passion for clearing up what they call ‘abusive discharge’ – illegal dumps in nature spots. When we ask him what else we might be able to do to move the matter of the ravine, he advises us to go to the town hall and request to speak to the mayor today, as he is available to the general public on Wednesdays. We take to the Antoninis straight away, they are men of action and straight, clear talk, no sides. Antonino the older tells us with a proud smile that between the two of them they keep Zafferana clean. The little Tuc-tuc is impressive too, seemingly small but able to swallow a large amount of rubbish bags. We take a quick photo and off their go, not before leaving us another role of large rubbish bags and the promise that they will come back and pick them up once we’ve filled them. One of the things I love about the Italians and even more so the Sicilians, is their irrepressible love of food and all things related. I was invited out to a meal, hosted by one of the horse-owners’ partners and we were 12 around the table. I was told it was to be a very simple affair with anti-pasti and tomato bruschetta. I was to be picked up at 8 from the Maneggio and thought I’d go down to the main entrance, to save them driving up through the property and opening and closing the substantially padlocked metal gates. At 8.20 I began to worry that I’d been forgotten but then someone showed up and whisked me off into town. At 9.20 the last of the guests arrived and everyone tucked in to the spread of olives, salami, Parma ham, artichoke hearts etc. which was followed by trays of tomato and garlic bruschetta and then a bottomless bowl of the freshest, most succulent Mozzarella. The partner, a Neapolitan by birth, had ordered a special delivery the day before and had gone to pick it up from the port himself, telling us in detail how the crossing had been delayed by bad weather and, of course, the provenance of the Buffalo cheese, a speciality of his home town and region. I’d never tasted anything like it! During the meal, as so often happens, conversations centred around food. It seems the more memorable or special the meal is, the more mouth-watering the reminiscences and descriptions are. I can’t help feeling that conversations about other peoples’ recipes and preparations might be deemed offensive to the hostess back in the UK, but here the waxing lyrical about an Aunt’s or Gran’s superior methods/results, is par for the course. The prosecco and wine flowed freely and the meal ended with the ritual dusting of the Pan D’Oro in the bag, a treat for the 10 year-old son. I’m having to up my daily exercises and physical work, collecting and sawing wood, to keep hold of my waist-line! 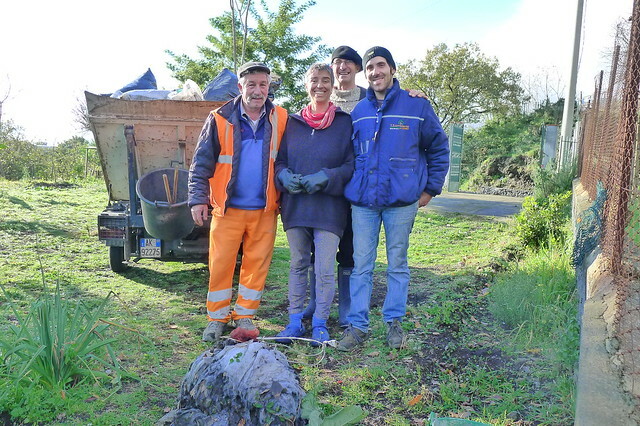 The work of cleaning the ravine at Passopomo cannot be done by us alone – it needs professional power, with the right machines to lever the vehicles out, and people in protective gear who can deal with the poisonous stuff. So we decide to approach Zafferana Council – we’ve been told that they have a good reputation for environmental awareness. Our first attempt is an email (which, if you are interested, you can read here in English as well as its’ Italian translation), but neither of the three addresses we find on the internet seem to work. So on January 5th, we take a paper copy and try to deliver it by hand. The doors of the town hall are open but everything seems very quiet. We pass by an unmanned reception and venture into the belly of the administration. However, the only people at work on this day are cleaners and the police. We try again the next morning, and you can read about that visit in a previous chapter. Entering the town hall of Zafferana is like entering some kind of theatre play. Every character seems exaggerated, almost cliché – we have the beautiful, doe-eyed secretary; the grandiose, benevolent, fast talking higher official; the mute and slightly grumpy ‘fat controller’ who doesn’t move from behind his desk; the serious, intelligent and ambitious young consigliere, and, last but not least, the very important Mayor, in his splendid (and verging on the opulent) large office on the upper floor, facing the town square and overlooking his ‘realm’ all the way down to the sea. We don’t meet the mayor until our 4th visit though. Before that, we pay another visit to the waste disposal office on the floor below, where despite becoming known for uncomfortable information, we find an open ear and a generous reception. We are here to find out if anything has happened ‘back stage’ in the two weeks since our first visit, since we have not seen any changes at the ravine, other than more rubbish having been dumped. Alfredo, in charge of waste in this town, gets a bit more involved in the conversation than last time we called round. He asks us if we can give the council one more week to come up with an action plan. This makes me reflect on how these people see us. We are foreigners and this seems to give us some kind of kudos, we are respected, listened to and treated very politely. I try to imagine how it would be in England – let’s say a Sicilian arrives at Totnes town council to report an illegal dump and ask for its removal. Somehow I doubt that they would be paid the same kind of attention we receive here… Nevertheless, we are slightly frustrated by the permanent reply of ‘non e facile’. Well, yes, we know it’s not easy. We know it will cost money and requires several organisations to work together, but this should not mean that nothing is being done. In the same way as two weeks ago, more people gradually arrive and are shocked by the story, especially when I mention that there are fresh animal carcasses and that we cannot do anymore cleaning ourselves as last time he went to the ravine, Frank contracted some kind of bug, possibly from being in the vicinity of the cadavers. As no-one tells us to leave (or more likely, we don’t get the subtle ‘hints’ since we are not fluent in Italian, let alone au fait with Sicilian cultural undertones), we sit in the office and present our case for about half an hour. 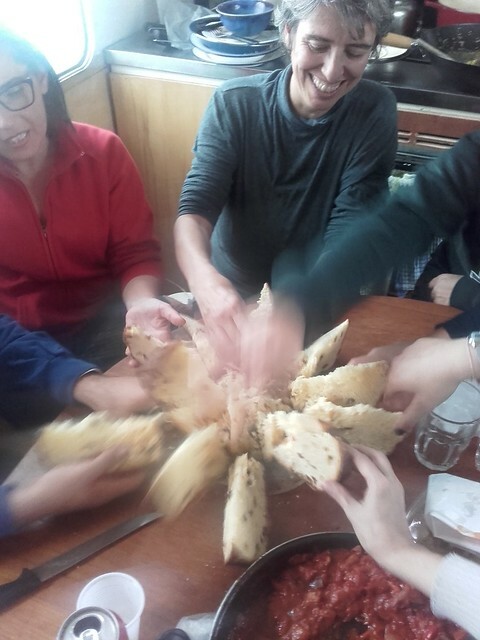 Before we leave, Antonino promises to come at 9am the next morning. Below is a photo of the new lot of rubbish in the ravine, with a horse’s head perched on top. Posted in Spazzatura Siciliana, Uncategorizedwith comments disabled. Rosi, who runs the riding school, lent me her car to drive Ruth to the airport in Catania, for her week-long trip to Berlin. It was odd driving back to Passopomo without her but I began to make a mental list of all the things I wanted to do while she was away – help Rosi out with the horses, make more marmalade (I’d been told that the root stock onto which they graft Mandarins, was the bitter Seville orange and that there were many trees on the abandoned farmland around the Maneggio which had fruit on their lower branches perfect for Marmalade making), fix the driver’s- side step, which had been damaged at the Hot Springs weeks back in Saturnia, fill the wood-store – there being plenty of fallen/dead trees on the uncared-for estate and of course continue the clear-up of the river-bed, prior to the visit of the team from the Town Hall. Sadly, I got back from the airport to be told that the council had been and gone with a small pick-up truck – I had the key to the neighbour’s property which they needed, to access the pile of rubbish we’d already gathered from our clean-up sessions… A week later they made another appointment for a site-visit, this time it was called off because it was raining ! Christ, if they did that in Wales, they’d only work half the year! Two days later the neighbour texted me to say they’d been to clear the rubbish – I was confused. I ‘wrote’ back to tell him how delighted I was but what a shame I hadn’t been there to take photographs for our documentation of the ‘project’. Meanwhile, Gianni, who had already taken Ruth and I on an amazing walk below Etna, had invited me on another one, sensing that I was already missing Ruth and heading out at 7 am the next day, in time to catch the extraordinary rose glow that sunrise gives to the snow-capped volcano and surrounding area. It was truly unforgettable visually but also rich in shared conversations about language, nature and Sicilian culture. On our return, I couldn’t wait to see how much they’d done at the ravine and was disappointed to find the pile below Giacomo’s property hadn’t moved. So, I set off up the river-bed towards the bridge, where the worst of the ‘dumping’ can be seen, only to find no change there either! I took out my frustration on a few more hours of clearing and on my way back to Emma, gathering a barrow-full of wood for Emma’s stove and the fire-place in the communal room at Passopomo. It was only the following day, when I’d had no reply from Giacomo, that I realized that his initial message lacked a question mark. The next day Gianni drove me to the local hardware store, Emma’s step tucked under my arm, to buy the correct bolts for the job (there was no way of taking a measurement, as the bolt holes disappeared into the step casing, with no way of knowing how deep they went). After a few attempts by the friendly man behind the counter we plumped for a set, complete with assorted washers. Since that day it’s rained on and off and Emma is stood in a muddy part of a field, so sliding under the cab hasn’t really appealed to me, so it’s been added to the ‘to-do’ list. Given the turn in the weather, I set about another Marmalade-making session, this time filling an assorted selection of saved jars: I’m up to about 30 now but it seems as fast as I make them the sooner they leave us in the form of presents. It’s so nice to be able to give something home-made and it often takes people by surprise that it’s come out of our camper-van home. Saturday comes around quicker than I’d hoped and it’s time to pick Ruth up from Catania airport – not a day too soon, as I miss her terribly and can’t wait to hear how she got on with Yoli in Berlin. 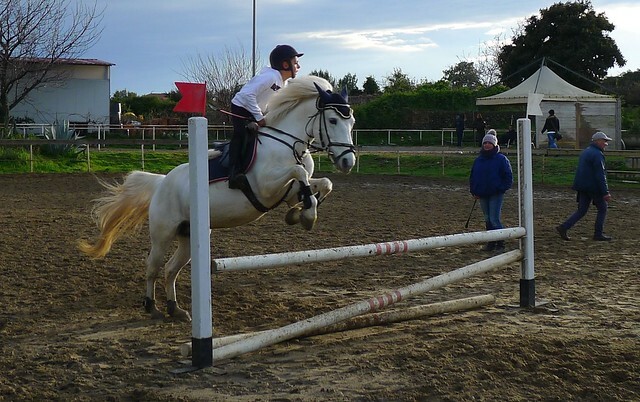 Passopomo is synonymous with Paradise for children and teenagers who love being outdoors with animals, especially horses. Hardly a day passes without 10 year old Davide showing up and taking his horse for a ride. If it’s wet, he trains Dixon on a long reign in the sandy patch by the side of our Emma. If it’s dry, he’ll be in the manegio with the others, exercising the horses, trotting, cantering and jumping. It’s a joy to watch them. Rosi gives some input, but I think most of all, they learn by watching each other and being around the horses a lot. When they go off to a local competition, they come back with prizes, even for things like doing gymnastics on horses, which they rarely practice, except when they stand on the saddle to reach for oranges from the trees! They enjoy finishing ahead of the kids from more prestigious pony clubs. 18 year old Katerina is also a regular and helps a lot mucking out the horses. She is training to become a vet. When the horses have exercised, everyone gathers and trots off for a ramble through the vineyard. It’s fantastic to have such a large enclosed space to go riding in – no roads to cross and plenty of paths weaving up and down the fields. Here are more photos of the horses and their owners/riders. I don’t know if you remember my entry from May 2015 called “Water“. I have just come across a beautiful and inspiring film about reforestation in Brazil. Well worth a watch! If it is possible there, it is possible in Europe! 13th Passopomo – The blacksmith is here! There are 22 horses in Passopomo. One day, the blacksmith arrives with his mobile forge. 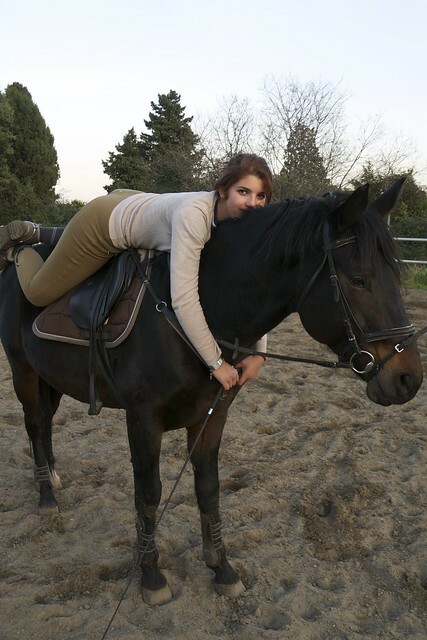 There are several horses ‘parked’ in Passopomo, with flexible arrangements as to how much Rosi takes care of them or their owners come and do the work themselves. Gianni is here almost every day to look after his horses and to his dismay, he sees us getting embroiled in the rubbish in the ravine. 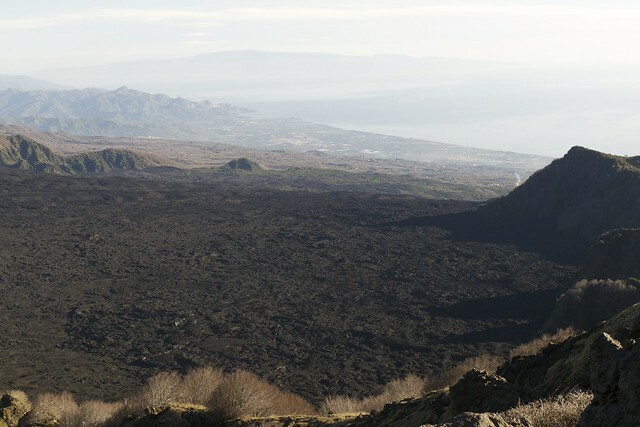 To create a balance and to show us that not every Sicilian has a careless attitude towards nature, he offers to take us on walks and to introduce us to what he calls his ‘amante’, Mount Etna. Going on a trip with Gianni is a special treat. He is a lover of nature, of language and a bit of a philosopher too, and he has a lot of local knowledge. We spend a day in interesting conversation and admiring the beauty of the landscape. 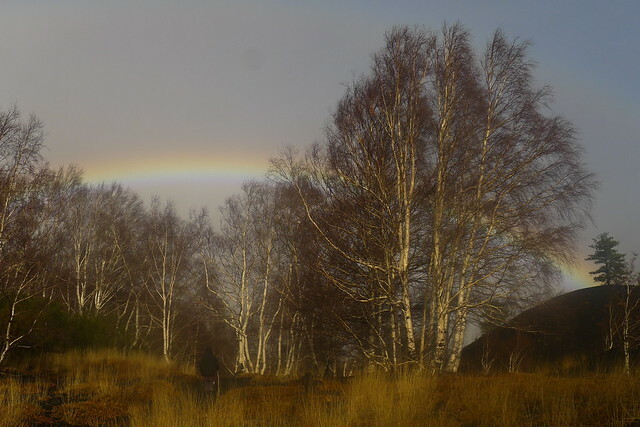 It is a very stormy day and the light up there is spectacular, with dramatic cloud formations and a double rainbow. At some point, the wind is so strong that Gianni advises not go to the top of a hill as we might be blown off. Frank only reluctantly heeds his advice – I’m glad to say he’s still with us. The landscape is extraordinary. 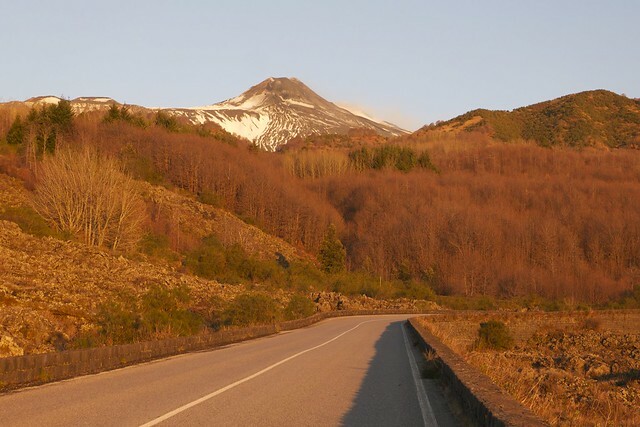 It is the most beautiful birch forest I have ever seen, which Gianni tells us is a type of birch that only grows here. The colour contrasts of the black volcanic ground and the yellow grasses, the white birches and the dramatic skies make for incredible photos! Please make yourself a cup of tea, sit down and click on our flikr album – make sure you put it on the slide show function! A spontaneous decision to go and visit my daughter takes me to Berlin for a week while Frank stays in Passopomo. It feels strange, separating from each other, and that in itself is still a strange feeling. I used to be someone who welcomed space to herself after being together non-stop for a few days with someone, no matter how much I loved them. But with Frank it is different. I just never tire of his company, his warmth in body and soul, and the sun we both light in each others’ hearts. Everything we do together is doubly precious and intensive, deeper, wider, happier, crazier. When our relationship started, it was a wonder how easily we joined two completely independent lives with properties 200km part and completely separate sets of friends and family. Love overrode all logistic obstacles. Having just come out of a long distance relationship, it was clear to me that I didn’t want more of the on-off nature that living separately gives to a relationship. But neither did we want to give up either of our homes. So we started living in both places, always travelling together from one to the other; a pattern developed that could be described as a long distance relationship with our houses instead of each other. We have found a deep love and companionship in each other and it still feels so amazing to wake up each morning and feel blessed to have such a precious person right next to me. Anyway, I digress. Back to Berlin. It is really good timing to be here, as I have finally received the go-ahead from the Rudolf Steiner School, the venue for the Tango Mango, so now I have a few day’s work to do until I can open the booking lines, which would have been difficult in Passopomo where there is no access to the internet. After a solid slot of 8 hours on the computer, I decide it is time to close the thing and go dancing. Mala Junta offers Sunday afternoon dancing, so I wrap myself up (it’s about 15 degrees colder here than in Sicily) and brave the icy pavements to throw myself into the arms of the Berlin Tango community. I meet some good friends and have some lovely dances with them, but once they are gone, I don’t receive any cabeceos (invites to dance, per eye contact). I don’t mind at all, it’s a joy to just sit and watch the high level of dancing, close embrace, musical, a small and intimate style, and it gives me time to reflect on Tango. What a contrast to the Tango I’ve been to in Catania where the dance floor is a mirror of the Sicilian roads, with everyone racing and cutting across each other with scant regard for the other’s trajectory. In Catania, the men use too much force in their arms and consequently the women don’t know where their axis is, and neither of them are listening to the music it seems. Of course there are exceptions, and you can spot them straight away – they are like islands of calm in a stormy sea. Posted in Uncategorizedwith 8 comments.